"Loved the front desk staff who told us about all the interes..."
Have a question for Best Western Plus El Rancho Inn? "Large clean rooms with easy parking." "Hotel is reasonably well kept." Conveniently located in San Francisco (CA), Best Western Plus El Rancho Inn and Suites is a great base from which to explore this vibrant city. From here, guests can enjoy easy access to all that the lively city has to offer. A well-kempt environment and its proximity to Marina Vista Park, Green Hills Country Club, Union League Golf and Country Club give to this hotel a special charm. At Best Western Plus El Rancho Inn and Suites, the excellent service and superior facilities make for an unforgettable stay. A selection of top-class facilities such as free Wi-Fi in all rooms, daily housekeeping, 24-hour front desk, facilities for disabled guests, Wi-Fi in public areas can be enjoyed at the hotel. 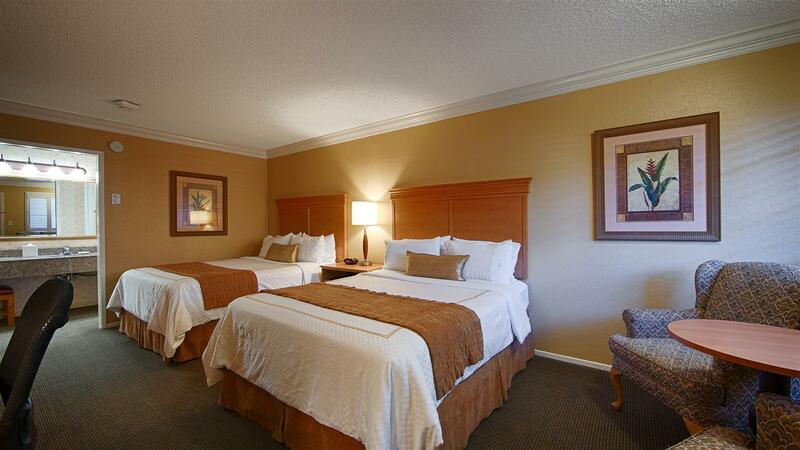 The ambiance of Best Western Plus El Rancho Inn and Suites is reflected in every guestroom. separate living room, internet access – wireless, internet access – wireless (complimentary), air conditioning, heating are just some of the facilities that can be found throughout the property. The hotel's recreational facilities, which include hot tub, fitness center, outdoor pool are designed for escape and relaxation. Whatever your purpose of visit, Best Western Plus El Rancho Inn and Suites is an excellent choice for your stay in San Francisco (CA). "Looks like resort, nice staff, clean, safe." Hotel is reasonably well kept. Problem is rooms on the ground floor is just next to the parking lot with a walkway in between. When car started its engine, feeling like it is next to your bed. It's too shout of distance. I got waking up few times during the night because of that. Very friendly staff! Large clean rooms with easy parking. Generally good hotel, only be aware rooms on the ground floor is only a hand length distance away from the parked cars, in the morning when engine-start noise could be annoying. Clean Rooms, Friendly reception staffs, nice free breakfast / "Departure snack" offering coffees / teas / hot chocolate, oats, muffins, egg ham cheese puff (nice! ), juice, toasts, bagels from 4.30am - 9.30am. Touring San Francisco but did not think location is a hassle as hotel provides 24h free transfer to airport (BART station). Rode $18 Uber Pool rides to and from SF downtown. Thus great price for such room at not too bad location. Better if you are just transiting SFO. reception staff were friendly as well. My wife and I stayed at the Best Western Plus El Rancho overnight as we arrived on an international flight and our domestic flight out was the following day. The hotel is average with a lot of rooms and the parking was kind of a hassle with all the other guests there. The restaurant is on premises but you have to walk outside to get there and the menu is limited. Overall rating on this hotel is average 3 out of 5. So tight space for two people. Smelly room. Good airport transfer. Suitable if you have to find a place to stay few hours before catching another flight. Walk distant to restaurants, grocers and BART station. I was staying by myself and someone started to manipulate with my door late at night. The person punched my door back, which showed aggression. The attendant did not help. He brushed it off that it was the pizza delivery. I will not go to ranch style inns anymore and not this one again. The price was also expensive for all this to have occurred. Free Wi-Fi and a cable TV with premium channels are provided in each guest room at the Best Western PLUS El Rancho Inn. A private bathroom with free toiletries and a hairdryer is included. A free shuttle service to the nearby BART (Bay Area Rapid Transit) train station for easy access to San Francisco and Oakland is available. Guests will also appreciate the seasonal heated outdoor pool and the on-site fitness center. Room clean but shower didn't work. Breakfast pretty poor. Staff friendly. Loved the front desk staff who told us about all the interesting history of the hotel. You'll have to ask! Convenient to airport . Nice service and meal at the restaurant. Staff courteous and helpful. Walking distance to restaurant and nice continental breakfast. Staff were very helpful upon arrival and assisted with our planning to return rental car that evening with hotel shuttle return to the hotel.